Slides on and then clamps securely. 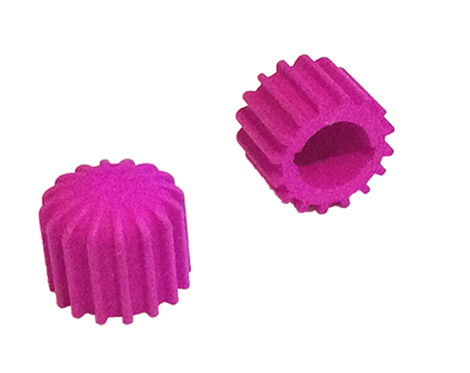 Available in 8 colours, this is a simple nylon cap to protect BNC video connectors from impact and dust. It pushes on and then rotates on the baynet to lock in place. The radial fins act as an impact protection while also making it easy to rotate the cap on and off. The idea and design originally came after having to replace one of the male BNC connectors on a Steadicam sled&apos;s lower housing after a member of the grip department docked it, shall we say, enthusiastically, on the docking stand, &apos;dinging&apos; the BNC slightly. I always considered the BNC connector a pretty roughly toleranced connector but although the &apos;out-of-round&apos; produced by the impact was only 0.2mm, there was no way it was ever going to connect with anything again and replacement was the only option. I now use these on all open BNCs as impact and dust protectors.